If you've always wondered about the magic of human and equine rapport, CLICK HERE and look at these priceless images! 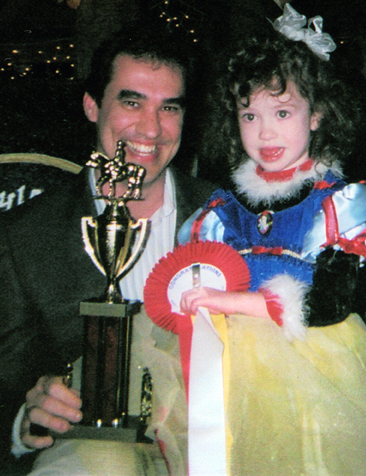 ETA is a highly specialized and personalized NARHA, PATH Int'l., Premier Center located in a beautiful and peaceful setting for children and adults, aged three and up, with mental and or physical challenges. ETA added three new buildings in 2006, and built a complete therapy suite with classroom, exercise room, reception area, and a new office. About 18% of our clients are children and adults who are not disabled, but who value private English or Western lessons from certified instructors that emphasize safety, and that are taught at a pace and with content that closely matches individual needs. All riders enjoy music, games, exercises, and stimulating books, which make this a much sought-after format! What Else Is New? 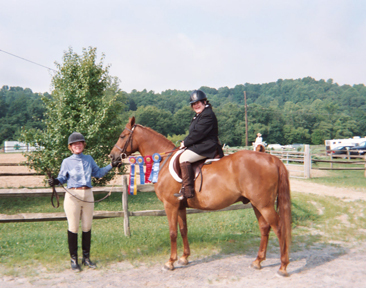 ETA recently inaugurated a Back-in-the-Saddle Program for former riders eager to restart equestrian lessons. ETA is now offering two "Try It, You'll Love It!" 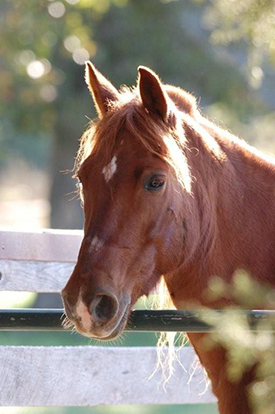 short Sessions of six lessons each, attractively priced at $500.00 a session, so that our established riders, as well as new riders, can explore the many and varied Equine Assisted Activities offered at ETA! ETA is pleased to announce that it has established a special licensing agreement with SpiritHorse International to offer its award-winning curriculum for individuals on The Autism Spectrum, Alzheimer's and related diseases, those with neo-natal and adult onset strokes, Cerebral Palsy, Down's Syndrome, Epilepsy, Hearing Impairments, Multiple Sclerosis, Obsessive Compulsive Disorder, Parkinson's, Sensory Integration Dysfunction, Speech Delays, Traumatic Brain Injury, and or Vision Impairments. ETA also recently hosted for the first time two courses for Elderhostel International, both with an educational and service component! ETA also offers national and international courses through the U.S. Department of Agriculture's referral service on Organic Farming, and Organic Farm Volunteer Training. 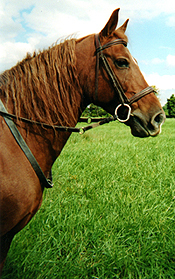 ETA has also expanded its service opportunities to county, state, and private entities interested in providing Vocational Training for the developmentally delayed with four new courses in Equine/Farm Groundskeeping (pasture management), Groom Training, Stable Management, and Stable Assistant Training. ETA is also now offering the services of a physical and an occupational therapist on an on-call basis, both for initial assessments and IEPs, as well as for lesson plan development. All of these new services are provided with an additional charge, and may be reimbursed by insurance and or outside bodies. ETA trailers to open shows, Special Olympics, MCET, eventing, and up to five shows with divisions for the Challenged Rider. Pre-Driving opportunities are now offered at ETA. ETA currently has two excellent driving ponies, with carts and harnesses. 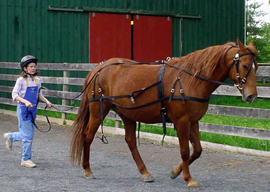 Therapeutic driving, challenged competition, and pleasure driving will be offered to those whose balance is not appropriate for riding, who find it uncomfortable to be mounted, who are overweight for our horses, and/ or who would learn best in a cart behind a horse or pony. Elementary Drill Team and Pre-Vaulting is offered as an adjunct activity along with a therapeutic riding series, if requested. ETA has dramatically expanded its Equine Assisted Activities programming by offering individual and group Pre-Vaulting classes, which are akin to gymnastics on pony-back. ETA is a Premier Operating Center member of North American Riding for the Handicapped (NARHA, PATH Int'l.,), and is fully accredited and insured. ETA is a unique NARHA, PATH Int'l., program that designs an individualized cognitive enrichment program for each client, each quarter of the year, using two to seven books that match the student's academic level. ETA also gives each student their own daily exercise program for use at home, which builds strength, flexibility, and endurance, as well as safety on their horse or pony! Safety is our top priority, so we loan certified helmets, boots, and body protectors to all students, instructors and volunteers. Regular private (not group) therapy lessons in a series of 11 or 12 each quarter are 1.5-2 hours in length, providing two to three times more contact time per session, at roughly the same cost as other local NARHA, PATH Int'l., centers! All of our lessons are private, offering superb one-on-one skills development. Up to 40% of our students receive scholarships. 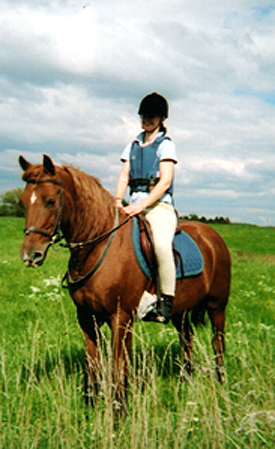 Our Senior Instructors average 25 years of equine experience, and each is NARHA, PATH Int'l., certified. ETA also hosts NARHA, PATH Int'l., Registered level Instructor candidates as Apprentices, and mentors them during the one to three year process. 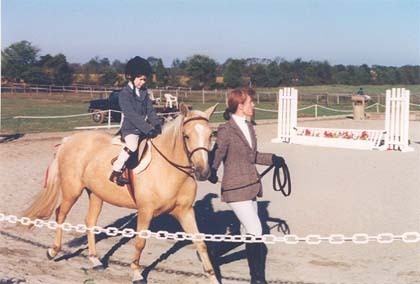 ETA has added six new programs: the Pre-riding Skills Development Programs for three year olds and those with substantial cases of autism and or developmental delays, a Seniors Riding Program, the Pre-Valuting Program, and a Pre-Driving Program for those with severe allergies and or a fear of heights. 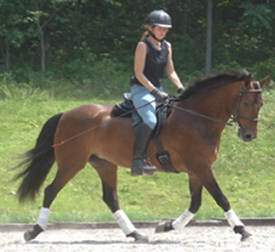 Each of these Pre-Riding or Pre-Driving classes are 30 minutes in length in a series of eight lessons. The Seniors lessons are 90 minutes in length, as are the individual or group Vaulting classes, and the private Driving classes. We train parents or other family members as sidewalkers, thereby assuring instant therapy feedback and creating an enjoyable family experience. ETA offers lessons year-around in English and Western, and will soon offer Pre-driving. ETA is located in Montgomery County’s beautiful Agricultural Reserve, 45 minutes from downtown DC, 35 minutes west of Bethesda/Chevy Chase, and 5 minutes west of Potomac, MD. Call (301) 972-7833 to schedule a visit today! ETA offers lessons to able-bodied riders as well. 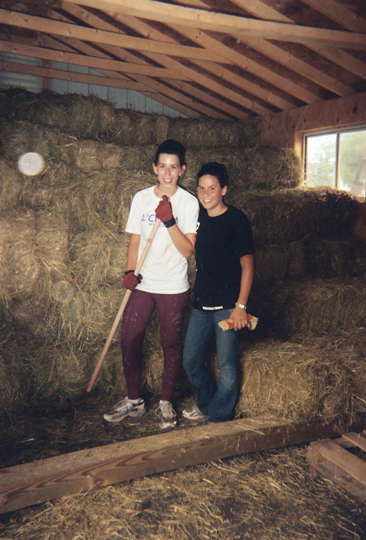 Even cleaning the hay barn can be fun! IN ADVANCE, AND ALL VISITORS MUST BE ACCOMPANIED ON THE GROUNDS AT ALL TIMES BY ETA STAFF AND OR THE OWNERS. He is pure air and fire." Special thanks to the following who helped with this dramatic improvement to our web site: photo credits: Robin Cooper, David Evans, Juliette Searight Evans, Carolyn Ewels, Christina Johnson, Chet Martin, Susan O'Connell, Don Rebus, Pat Sterrett; families who generously shared their photographs: the Agnews, the Atkocius and Andre families, the Berman-Fernandez family, the Coopers, the Dexters, the Searight-Evans family, Florencia Foxley, the Hansen-Gilmours, Duncan Groff, the Hauks, the Kent-Ewels, the Johnsons, the Lamas, the Lowes, the Martins, Siobhan O'Brian, the Wichmans, and many others who shared anonymously; with deepest appreciation to Andrew Gilmour for so generously supporting this web site upgrade and Grace Hansen-Gilmour for her skillful text updates and computer support. Finally, we thank Berry Thompson of aguythatcan.com, who so cheerfully helped me share the joy of our program, and who captured the essence of our mission with our new logo!